Produced by Silent Transport Ltd. of Woking (England) in 1948, the Eaglet was a small 3-wheeler 2-door electric car. A range of 25-30 miles per charge and a maximum speed of 30 mph were claimed. It appears few were sold, however the company also converted Opel Cadets and Fiat Topolinos to electric power, and may have sold a number of these conversions. The Eaton Electric Motor Carriage Co. of Boston MA showed a light electric 2-seater in Boston in 1898. Edison played with electric cars as well as many other things. His 1889 3-wheel electric run-about is in the holdings of the Henry Ford Museum in Dearborn MI. This is believed to be the first car built by Edison. 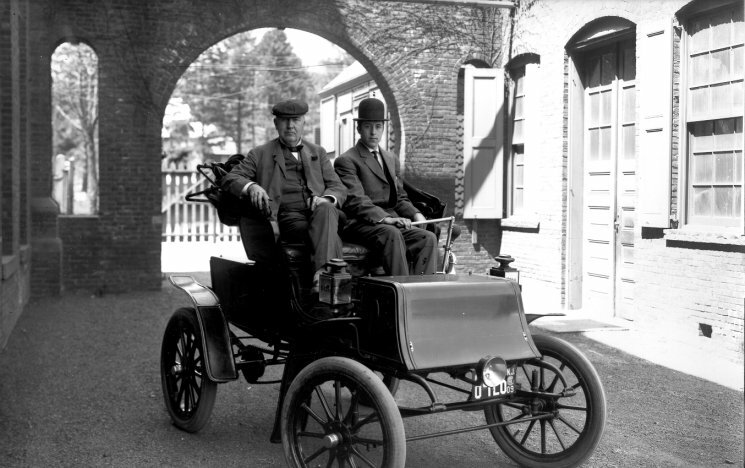 Photo of Thomas Edison and his son Chase in electric car (B&W - 80k)(original photo by Pach Brothers). This automobile appears to be the Edison electric car which saw very limited production (possibly 2 to 4 vehicles for Edison and friends) which is usually dated from 1914. Built by Zagato of Italy in the mid 1970's, the Elcars were a 2-door, 2-seater light electric car. They had fibreglass bodies and their suspension components drew heavily from Fiat cars of the period, notably the Fiat 124. Some 500 Elcars are believed to have been produced from 1974 to 1976. 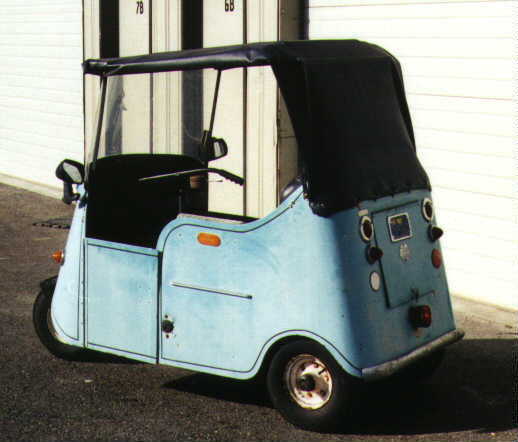 Zagato is supposed to have built 4-seater electric minicars in the early 1980's, but I have not found any reliable information on this vehicle. It is believed that 5 Elcars were imported into Canada. They are known to have run in Nepean ON, Bracebridge ON, Ottawa ON and London, ON. There is an Elcar in the collection of the S. Ray Miller Antique Auto Museum in Elkhart IN. 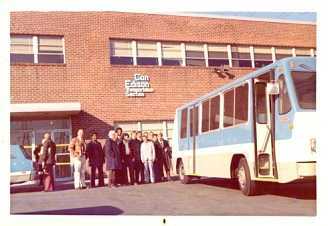 The North American Elcars were assembled in Elkhart in the 1970's. An interesting side-note: There were "Elcars" produced in Elkhart IN from 1916 to 1931, initially by the brothers William B. and George B. Pratt, and after 1921 by former Auburn executives, but they were not electric. This firm is still in operation and has their own Web page, so they can best tell you about themselves. This Electra was produced by H. Krüger of Berlin (Germany) from 1899 to 1900. It was a small 3-wheeler, 2 seater electric car. This Electra was produced by the Electra Storage Battery Power Co. of Chicago IL from 1913 to 1915. The car was an enclosed body, 2-seater weighing in at just 750 pounds. It used a 2.5 hp electric drive motor. The Electra-Car was a wheelchair transporter built by E.T. Systems of Toronto ON circa 1981. This vehicle was built to permit a wheelchair to be driven into it, then permit the occupant of the wheelchair to operate the car. A top speed of 20 mph was claimed for this very small vehicle. Electra King - see B & Z Electric Car Co. In the 1970's, the Die Mesh Corp. built the Electra Spider prototype electric car. It used 18 lead-acid batteries for energy storage, had a gross vehicle weight rating of 1,295 kg, and claimed a maximum speed of 88 km/h and a range of 45 to 80 km per charge depending on driving conditions. Started by Robert Aronson in the late 1960's, this firm has developed a number of prototypes based on conversions of mass-produced gasoline-powered vehicles, but has not yet managed significant production of any of these vehicles. It was an EFP vehicle that won the 1970 Clean Air Race in the U.S. Over the years, these prototypes have included the following vehicles. An AMC Hornet converted to electric propulsion by American Motors Corporation and Electric Fuel Propulsion in the 1970's. A top speed of 69 mph and a range of 73 miles at a constant 40 mph were claimed for this car. The Mars I and Mars II were converted Renault 10's. 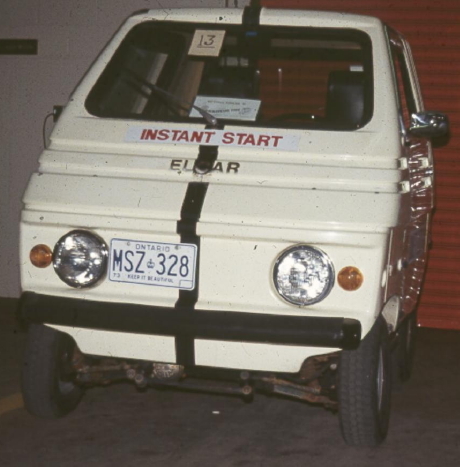 At least 40 of the Mars II cars were produced, many of which were sold to electrical utility companies in the U.S. A Mars II was sold to Calgary City Power, which was subsequently provided to the University of Calgary. The Silver Volt was a converted Chevrolet Chevelle, with significant styling changes to disguise the origin of the shell. The Transformer 1 was a converted AMC Gremlin. The Electric Shopper was produced by Electric Shopper Co. of Long Beach CA from 1952 to 1962 (per Standard Catalog of American Cars 1946-1975). There appears to have been only one model, a run-about with a 61-inch wheelbase. A correspondent has described to me a 1956 model with a steel body, 24-volt, tiller steering, top, wrap around windshield, and doors. 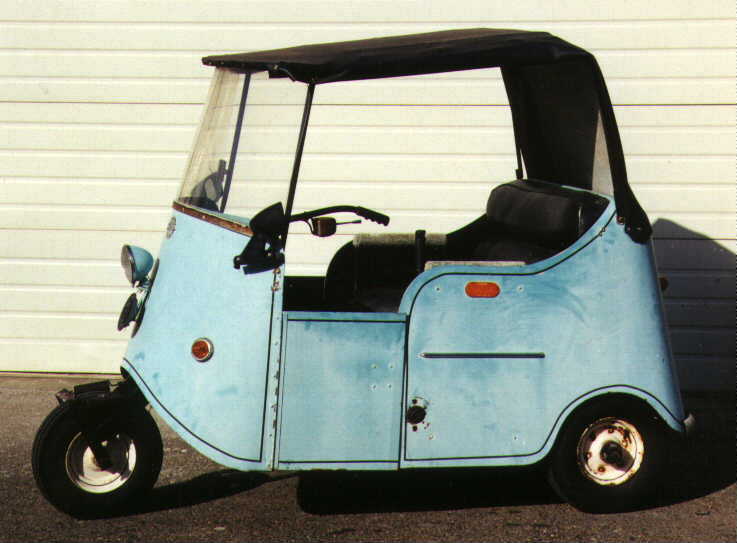 Later models (at least as late as 1964) appear to have included a small 3-wheeler with a plastic body. It was a low-speed, short-range vehicle designed specifically for short errands as suggested by its name. Both fiberglass and steel bodies were available, with the steel versions being less expensive. Power was supplied by a 24-volt, series DC motor rated at 1.5 hp. Top speed was approximately 18 mph and range was claimed to be over 30 miles per charge. The body was 86 inches long. Photo of Electric Shopper, left side profile. Photo courtesy of Bob Boyer, used here with permission (colour - 39k). Photo of Electric Shopper, front right 3/4 profile. Photo courtesy of Bob Boyer, used here with permission (colour - 40k). Photo of Electric Shopper, rear left 3/4 profile. Photo courtesy of Bob Boyer, used here with permission (colour - 25k). Produced by British Leyland in England in the early 1980's, this was a large truck. This company was located in Cleveland OH from 1974 to 1982, and were known for converting gasoline-powered cars to electric power. They produced several models, possibly including a small van, a small pickup truck and a Ford Mustang, in addition to those listed below. Conversion of an AMC Pacer station wagon. At least 50 of these were produced, most of which ended up in demonstration projects sponsored by the U.S. Department of Energy in the late 1970's. One of these vehicles was operated by Varta Batteries in Montréal, PQ, which was later purchased and operated privately in British Columbia. The Current Fare was a conversion of a Ford Fairmont. Both sedans and station wagon versions were produced. 20 of these vehicles were purchased by New York Consolidated Edison in 1981 and operated by Con Ed for several years. Ontario Hydro had one of the station wagon versions in the 1980's. Originally designed by Otis Elevator in 1973, this design was subsequently built by a company called Electrobus, and beginning in 1976, by EVA in Cleveland. At least 11 were built and put into service. 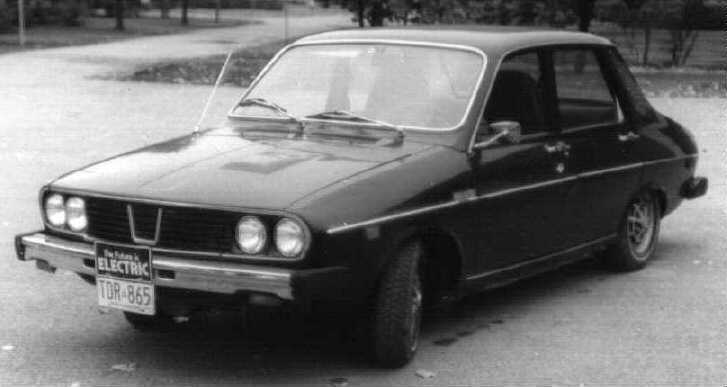 This was a conversion of a Renault 12, a 4-door, 4-seater, front-wheel drive car using an automatic 3-speed transmission. The car had a curb weight of 3, 150 pounds, and a GVW rating of 3,750 pounds. Range on a single charge was claimed to be 58 miles at approximately 25 mph, 34 miles at 35 miles per hour, 37 miles at 45 miles per hour and 33 miles at 55 mph (the advertised maximum speed). Acceleration from 0-30 mph was claimed to be less than 15 seconds, and 0-45 mph in 27 seconds. One of these appeared in Jimmy Carter's U.S. Presidential Inauguration Parade in 1977. Seven were sold as a fleet to the Province of Manitoba in 1975, which 2 were subsequently donated to the University of Manitoba in Winnipeg and 5 were auctioned off to individuals and ended up in Gimli MB, Winnipeg MB, Calgary, AB, Edmonton AB and Ottawa ON. The author drove one until 2002, when it was retired. The Electric Vehicle Association of Canada (EVAC) was founded in 1978. The founding members were Fred Johnson, Fred Green, Nelson Durie and Darryl McMahon with encouragement from Renton Patterson. Fred Johnson was the original Executive Director. In the early 1980s, the organization chose to eliminate individual membership (although it was individual EV enthusiasts that had founded the organization) and focus on bringing in large companies as members. Individual membership was re-instated in the 1990s to try to increase revenue, but few individuals joined due to the prohibitive membership fee. Individuals were purged from membership again after 2000. EVAC effectively became dormant in 2003 and closed operations entirely in either late 2004 or 2005. While the national Canadian electric vehicle organization was legally named Electric Vehicle Association of Canada (EVAC) / Association des Véhicules Électrique du Canada (AVEC), the original working name for the assocation was Canadian Electric Vehicle Association (CEVA) see also. This was a 2-seater, 3-wheeler cyclecar built in Couaillet 77 Rue des Rosiers, St. Ouen (Seine, France) from 1920 to 1924. It used a single 2.5 hp motor. 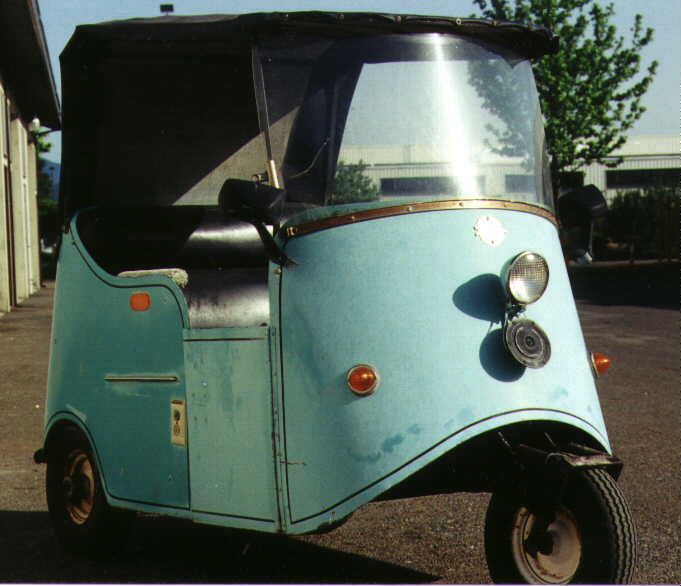 The Electricshaw was developed by Dr. Peter Quandt of Edmonton AB in the 1970's. It claimed a range of 100 miles on a charge and a top speed of 60 mph. There is no evidence of production beyond the prototype stage. The following information and images have been provided by Mr. Edwin Winet, who worked on the vehicle. The motor/generator was attached/ adapted directly to the VW transaxle flange. Most all of the electronics and electrics were installed in the original engine (now D.C. motor) compartment, for fairly easy access. The (front)gas tank was removed for luggage space, the charging adjustment transformer, the main D.C. circuit breaker . and the reel cord mechanism. The car came from the shores of Lake Michigan, near Chicago. It was in storage, for a while, at its builder’s home, near the harsh winters of the lake, that brought me into the picture: It was purchased from the builder by a new “company” called: “Electrocar”, founded by 2 Doctorate Engineers and a lawyer. I was engaged to restore the car’s electrical system, and the car, test drive the car and commute with it, a 56 Mile round trip, which it accomplished with ease. The car’s motor could “idle” at 1800 RPM, or start from a still shaft. Of course, it had electro-dynamic braking! The accelerator pedal was a 1910 sewing machine foot control, that controlled the D.C. field transistors. I drove it for 2 weeks and decided that I would give it to them, but FIRST, I did a high speed stop-watch timed 1 mile run. The speed achieved, was 120 MPH! I decided that I would limit the field current to 75 MPH, (a wise choice!!!) I added forced air cooling to the motor, thermostatically controlled. The guys drove the car for about a month, with no issues. The car’s California history was 6 months long. A simple, fast design, with standard parts that I put a lot of effort into restoring. The lady in the first photo is the Wife of Dr. Hugo Meyer. The Ammeter was for showing acceleration, cruise and regenerative braking currents. Utilizing the _original drive line allowed for LIMITING current, by "going through the gears". Use of 1st gear 3rd gear (sometimes) and 4th gear were adequate. The modified instrument (on the right) was calibrated in 0 TO 100 PERCENT of charge amount remaining. The motor picture shows the original 6 Volt Ghia battery, which was eliminated, for simplicity. This area became the home for the forced air cooling of the motor, thermostatically controlled. (Modified tank type vacuum cleaner (5 stage blower), 120 Volt AC/DC type). Speed tests were conducted, with top speed being well over 100MPH! The Ghia was a 1956. The change to EV happened about 1966 (one of the main components new in 1966) and the Electro Car folks pulled it out of the engineer's garage just before hiring Edwin in October of 1968. Produced by Electro Car Inc. (in the 1970s?, presumably not the same as Electrocar, Inc. in the previous entry), the Electro Car 600 was a 4-passenger car with a gross vehicle weight rating of 1638 kg, a range of 64 km per charge and a maximum speed of 97 km/h. Produced by Nepa Mfg Co. of Pasadena CA beginning in 1962, this was light electric car (weighing 680 pounds) built of steel and fibreglass. Maximum speed was 20 mph, with a range of 40 miles on a charge. Six 6-volt golf-cart batteries supplied power to the single 2 hp electric motor which drove the vehicle. This car was produced by Cie. Parisienne des Voitures Electriques, of 35 Rue de Ponthieu, Nice (France) from 1941-1943. It was a light electric 2-seater in both open and closed body models. It is believed that a few hundred of these vehicles were produced. Maximum speed was 20 mph. A single 1.5 hp motor drove the vehicle. Not to be confused with the vehicle produced by Kriéger in the early 1900's. Not be confused with the Chapman vehicles (see Chapman) or the U.S.S.R. jeep which were also referred to as Electromobiles on occasion, these vehicles were produced by the British Electromobile Co. Ltd. of Prospect Works, Otley, Yorks, London (England) from 1901 to 1920. While a variety of models and configurations were produced, the early electrics from this firm were generally open-body 4-seaters, with a steering wheel on a tilted steering column, the electric motor mounted on the rear axle and batteries carried under the floor of the car. The vehicles were noted for their reliability. In 1919, the firm introduced the Elmo which featured an enclosed body and an 8.5 hp motor. It appears the Elmo was not a commercial success. Based in India, this firm produced the Silencia Electroped 24, a 24-volt electric moped. This vehicle may also have been marketed as the Electrona 24. The Societé l'Électromotion of 54 Avenue Montaigne, Paris (France) built electric cars from 1900 to 1909. Mostly 4-seaters were produced, and the styling was conventional for the period. 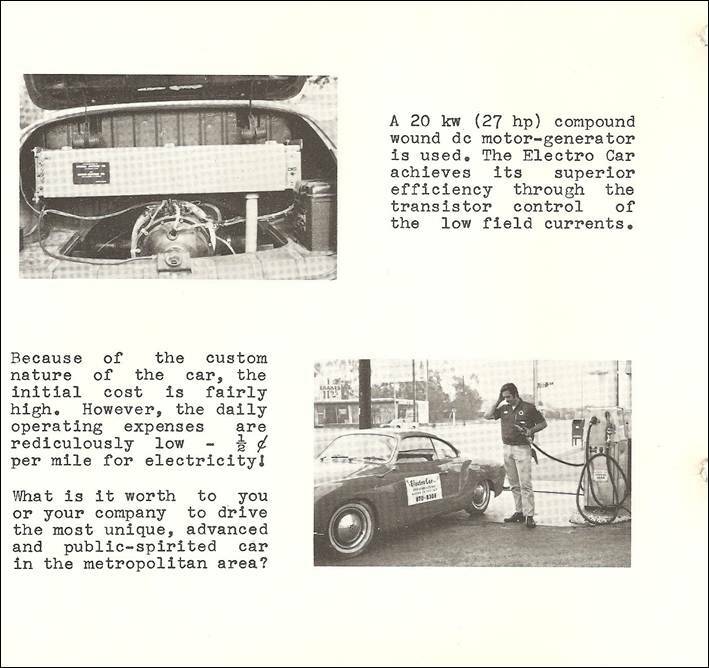 A joint venture of Otis (the elevator company) and EVA-Chloride, based in Bedford MA in the 1970's, this company produced a prototype delivery van which claimed a top speed of 45 mph and a range of 35 miles per charge using 14 6-volt lead-acid batteries weighing a total of 950 pounds. The Electronic Motor Car Corp. of Salt Lake City UT developed a prototype hybrid in 1955. The vehicle was a 2-seater sports car with a fibreglass body. The car used an on-board generator set to keep the battery pack charged while in operation. Other models were announced, but no other vehicles were ever produced. This small electric 2-seater was produced in Lyons (France) from 1943 to 1946. Presumably another vehicle produced in response to the scarcity of gasoline in France during the war years. In 1897 and 1898, Elieson Lamina Accumulator Syndicate Ltd. of London (England) offered an electric car, a taxi and a delivery van. The car was also known as the Swan. Elieson's primary contribution to the vehicles was the batteries, which were actually constructed by another firm (John Warrick & Co. Ltd. of Reading). The Ellis was an electric car based very much on small horse-drawn carriages, built by the Triumph Motor Vehicle Co. of Chicago IL (not to be confused with the British sports car maker) in 1900 and 1901. The Enfield 465 was a small electric car claiming a range of 60 km and a maximum speed of 60 km/h. It was powered by a 4.65-hp motor from a 48-volt lead-acid battery pack. The enclosed body was made of fibreglass and had sliding doors. While prototypes were produced, this particular vehicle does not appear to have seen significant production. The Enfield 8000 was designed from the ground-up to be an electric car. It was produced by Enfield Automotive of London (England) in the mid-1960s. These were 2-door, 4-seater cars with a reported range of 39 to 90 km per charge (depending on driving conditions) and a maximum speed of 64 km/h. The curb weight of the vehicle was 975 kg. It used a tubular steel chassis/frame and aluminum body panels. The motor was connected to a single-speed differential. Reversing the car was accomplished by reversing the drive motor by means of a forward/reverse electric switch on the dashboard. An on-board charger charged both the traction batteries and the accessory battery from any 240-volt, 13-amp outlet (common in Europe). Approximately 70 were purchased by the Electricity Council (England) in 1966 and supplied to electric utilities in England and Wales to demonstrate the practicality of electric cars. Early versions were fitted with 8 x 12-volt traction batteries and a single 12-volt accessory battery. The traction batteries were set up in parallel pairs, with the pairs connected in series to provide 48 volts. Problems with unequal charging and discharging of the parallel pairs resulted in the use of 8 x 6-volt batteries wired as a single series string (still producing 48 volts) being used in later versions of the car. The basic vehicles used a combination of battery switching (12, 24 and 48 volt settings) and field control on the motor to provide speed control. All batteries were in the circuit in all power configurations (to even the discharge). There is an Enfield 8000 in Vancouver BC which is the property of the Vancouver Electric Vehicle Association (VEVA), which was previously owned by BC Hydro. This vehicle was subsequently provided to an individual as a testbed for work on continuously variable transmissions. Another was reported in private hands in Toronto ON in 1979. In 1901, in Toronto ON, the E.R. Thomas Motor Company was producing electric cars. This company produced the Ivanhoe Electric Roadster, circa 1903. The company was later known as CCM (Canadian Cycle and Motor) and [Dead link: http://www.ccmcycle.com/anglais/pages/accueil.html] still produces bicycles today. This was a prototype vehicle produced under a project funded by the U.S. government (DOE) in the late 1970's. 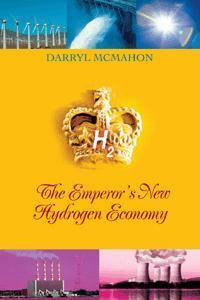 GE was the prime contractor for the design and development of the vehicle. Using 18 lead-acid batteries, the vehicle was a 4-seater which claimed a maximum speed of 96 km/h and a range of 112 to 184 km per charge, depending on driving conditions. The vehicle never went into production. This was a prototype vehicle produced by Garrett/AiResearch under a U.S. DOE contract in the late 1970's. EVA-Chloride was a joint venture of Electric Vehicle Associates of Cleveland OH and the Chloride battery company with its home base in England. 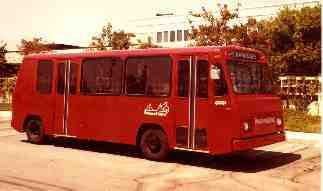 The Silent Rider was an all-electric 50-passenger bus produced in the late 1970's. The Silent Karrier was an all-electric delivery van. 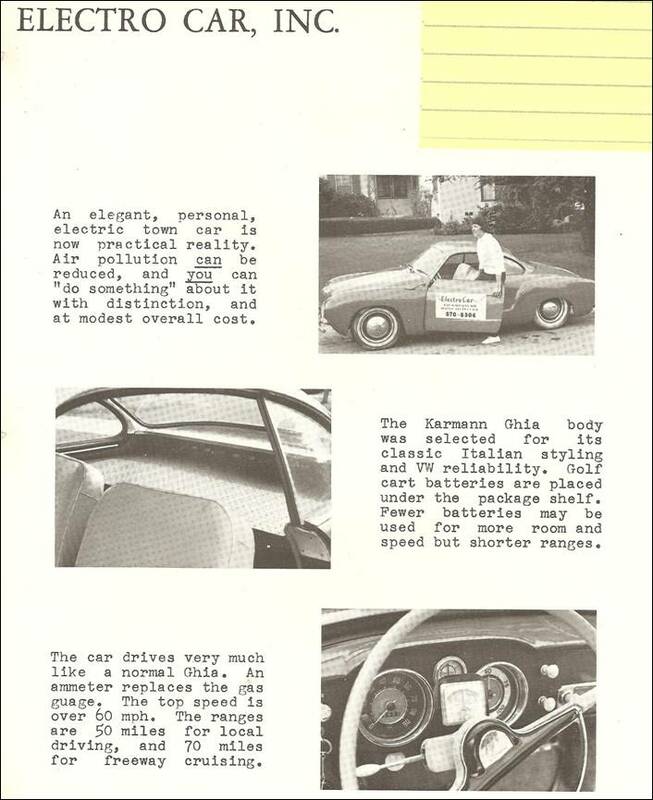 EVI Inc. of Sterling MI produced a 3-wheeler electric car in the 1970's with a claimed range of 45 miles per charge and a top speed of 25 mph. It does not appear that anything more than prototypes were produced.